The Australia Day Awards 2017 acknowledged the contributions of Northern Beaches people in the fields of sport, medicine, innovation, tourism, surf life saving and caring for veterans an their dependents – in fact there wasn’t one are of life not touched by this year’s awards. Although this is a long list of people who have done a lot for many for a long time, it is the inspiration they provide to others that stays with us. This Issue we run a Profile of the Week reprise of a lady who is empowering women and girls and has been doing so for the whole of her career – Christine Hopton OAM. Here we focus on John McInerney, the current Chair of the Veterans Centre Sydney Northern Beaches, and a Member of Avalon beach RSL sub-Branch who is part of the Vietnam Veterans Day (Northern) each year. John has been involved in the Veterans Centre Sydney Northern Beaches since conception. Firstly, conducting the feasibility study and then as the Project Manager through its start-up phases. John’s commercial experience includes senior management positions at Mobil, Mayne Nickless, Fujitsu and EMC. In recent years John has run a number of software companies and his own consultancy specialising in corporate strategy and culture. Called up in the 4th National Service Intake and who saw service in Vietnam in 1967, John is also a Legatee. 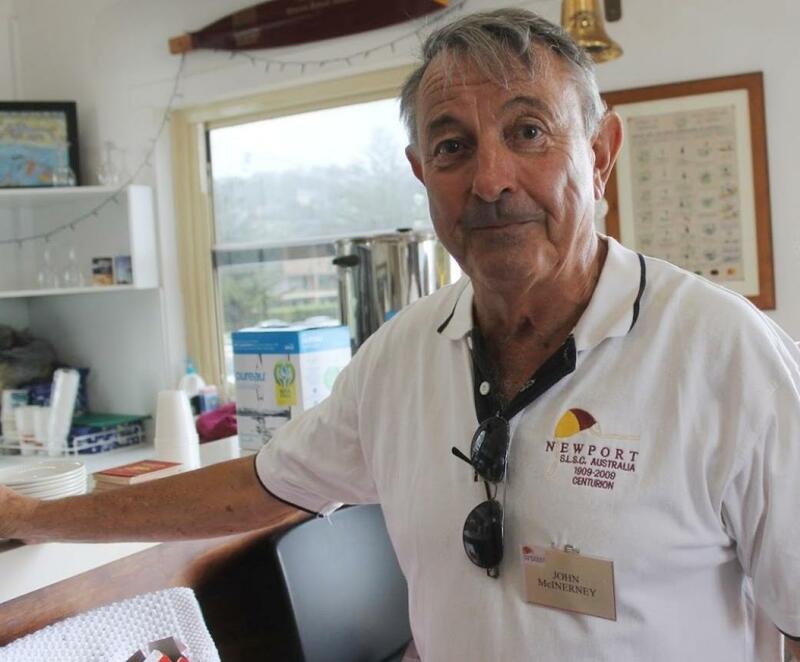 He has extensive involvement in Surf Life Saving having been a member of Newport Surf Life Saving Club for over 20 years, serving as President from 2000-2002. How did it feel to be awarded an OAM in this year’s Australia Day Awards? Slightly embarrassing as I think it’s more a reflection of all the people I’ve worked with over the years. As an example, one guy I know says that every time I come up with another idea he’s saying under his breath ‘more work’. You have also served as President at Newport SLSC? A number of years ago. I started at Newport as a Patrol Captain and went through over a number of years to President and now I’m a life Member there. Interestingly current Newport Surf Club President Rob Emerson is out of my Patrol and served as Club Captain when I was President. Doug Menzies is out of my old Patrol too. Newport has gone from strength to strength and to me this award is a reflection of people like Rob and Doug and all of those others who have come on a long journey with me – the crew that we put together to do the disabled squads, the many small and large progresses the club has made – so to me they own a part of this medal as much as me. The recognition also acknowledged all the work you have done alongside the late Graham Sloper in getting the Veterans Centre for Sydney Northern Beaches open – what is your current role there? At present I’m serving as Chairman, a role Graham asked me to undertake when his illness developed and his health deteriorated. This was something he had planned for, that I remain as one of the independent Directors and he asked me to step in as Interim Chairman and to take up the role when he resigned, which he did shortly before he passed away. We have three external directors in Grant Easterby, CEO at Dee Why RSL, Adrian Talbot, the current Manager for the RSL Life Care Homes for Heroes program, and Lindsay Godfrey who has been supportive of the Veterans centre since the outset. Bill Hardman serves as Treasurer, whom you would know from Forrestville RSL sub-Branch among many other roles he has fulfilled. Currently we have an application in for DGR Status, which is Deductible Gift Recipient – which would allow us to receive income tax deductible gifts and tax deductible contributions to put towards the services we provide. We’ll also be looking for an eminent person to take over the Chair this year as well, someone alike the ilk of Marcus Blackmore or with that level of acumen. I can then go back to an Interim Chair role or something similar – I’m a great believer in these roles being on rotation as this allows someone with fresh ideas and enthusiasm to bring that to the role. Avalon sub-Branch had its meeting today (Saturday January 28th) – what’s coming up for the sub-Branch this year – will there be a Tattoo? Discussions took place last year where, and although all the Services wished to support this community event, the reality is they don’t have the budget for this at present. Getting a Military Band was also proving to be a sticking point. There were a number of similar issues. There have now been some discussions over a combined effort between Palm Beach, Pittwater and Avalon but my focus has been on the Veterans Centre so I have not been part of this. As far as I’m aware the Avalon military Tattoo has evolved into the Northern Beaches Veterans and Community Day. It will be held on 12 November 2017 in Dunbar Park, Avalon Beach. The loss of Graham Sloper AM has also meant the loss of the Avalon Beach RSL sub-Branch President. Who will take on the role of President of Avalon Beach RSL sub-Branch in 2017? The Acting President is Robert Lacey until our next AGM on Saturday 25th February 2017. Michael Maley DSM RAN, who is also from Newport Surf Club, has put his hand up for the role. He’s currently serving as a Naval Officer with a rank of Captain, was awarded the Conspicuous Service Cross in the 2012 Queen’s Birthday Honours and is highly decorated. Michael is a very capable gentleman who will lead well and represent the branch just as well in any official roles outside sub-Branch. You made a record of the ANZAC Address he gave in 2012 in Pittwater Online. Thousands of people have given you a big thumbs up since we began sharing the news of your award earlier this week John – they also thank you, and well deserved. Thank you from us too. Member, Property Management Chapter Committee, since 1970s and Chair, 1983-1985. Representative, NSW Civil and Administrative Tribunal Liaison Group, current and Trainer and Assessor, since 1985. Member, Manly Warringah Branch, since 1966 and has held positions as Committee Member, President and Secretary. Consultant, Trading Reference Australia, since 2012. Patron, since 2004 and Board/Committee Member, 1961-2004. Life Member, since 1984 and Member, since 1945. Committee Member, Freshwater Surf Life Saving Club, 1962-1968 and Member, 1959-1965. Web Director, Rotary Club of Brookvale, since 2015. Treasurer, 1984 and Member, since 1982. Supporter/fundraiser, 'Inner Wheel Cord Blood Research Project', since 2001. Charter Member, Rotary Club of Balgowlah, 1974-1982. Regional Building Officer, Region 2, since 2013. Regional Building Officer, Region 1, 2009-2011. Past Junior Grand Warden, since 2007. Past Deputy Grand Director of Ceremonies, 1996. District Grand Inspector of Workings, District 10, 1996-2000. Master, Lodge Vaucluse #266, since 2014. Worshipful Master, Lodge Torchbearer #638, 2004-2005, and 1974-1975 and Member, since 1963. Justice of the Peace, since 1963.
estate agency', 1999 and Service Award, 1981. Recipient, Paul Harris Fellow, Rotary, 1998. Practitioner and Principal, Oaks Medical Centre, 1979-2015. Inaugural Chairman, College Foundation Committee, 2012-2015. Past Member, College Finance Committee, 2005-2011. Chair, College Building Committee, 2013-2015 and 2008-2009. Affiliated Member, Order of St Augustine, since 2006. For service to sport as a gold medallist at the Rio Olympic Games 2016. Gold Medallist and Olympic Champion, Laser Sailing, Rio Olympic Games, 2016. 1st, World Cup Champion, 2015. 1st, World Cup Champion, 2014. 2nd, International Sailing Federation Worlds, 2014. 3rd, Sailing World Cup, Weymouth and Portland, Great Britain, 2016. 3rd, Sailing World Cup, Heyres, France, 2016. 6th, Laser Standard Men's World Championship, Nuevo Vallarta, Mexico, 2016. 13th, World Cup, Miami, Florida, United States of America, 2015. 1st, Australian Championships, Lake Macquarie, 2015. For service to sport as a gold medallist at the Rio 2016 Olympic Games. Gold Medallist and Olympic Champion, Women's Rugby Sevens, Rio Olympic Games, 2016. A Team of the Year, I Support Women in Sport Awards, 2016. Winner, 2015-16 World Rugby Women's Sevens World Series. 1st, 2015-16 World Rugby Women's Sevens World Series, Atlanta, United States of America. 1st, 2015-16 World Rugby Women's Sevens World Series, Dubai, United Arab Emirates. 2nd, 2015-16 World Rugby Women's Sevens World Series, Clermont-Ferrand, France. 3rd, 2015-16 World Rugby Women's Sevens World Series, Langford, Canada. For service to medicine, and to medical administration. Director, Department of Diabetes, Endocrinology and Metabolism, 1999-2015. Senior Staff Specialist in Endocrinology, since 1993. Clinical Associate in Endocrinology, 1991-1993. Chair, Priority Advisory Committee, 2006-2007. Clinical Director, Chronic and Complex Medicine, 2011. Chair, Diabetes MOC Implementation Committee, since 2015. Clinical Lead Integrated Care, since 2014. Member, Health Advisory Council (AHAC), 2005-2010. Member, Clinical Council, since 2013. North Shore Private Hospital, since 1993. Clinical Professor of Medicine, Northern Clinical School, University of Sydney, since 2006. Chief Medical Officer, Bioatrix, since 2011. Member, Clinical Advisory Committee, Agency for Clinical Innovation (ACI), 2011. Board Member, Biomed North, 2011-2013. Steering Committee, Endocrinology Network, 2008-2011. Invited speaker at over 30 international scientific meetings, 1955-1970. More than 130 book chapters, publications and research articles. University Affiliated Postgraduate Teaching, Post Graduate Committee of Medicine (PGCM) 1990-1995. Member, Courses and Programs Sub-committee (PGCM) and Course Convener, 1990-1995. Councillor of the Australian Post-Graduate Federation, 1990-1995. Long and Short Case Examiner, since 1993. Supervisor, Advanced Trainee in Endocrinology, since 1993. Term Supervisor, Basic Trainee during Endocrine Rotation, since 1993. Endocrinology Tutorial Programme at RNSH, Coordinator, 1993-2003. Australian Diabetes Society (ADS) and Director 2005-2009 and Council Member, 1996-1998. 1st, 2015-16 World Rugby Women's Sevens World Series, Sao Paulo, Brazil. World School Games Representative, Qatar, 2009. Director, Surf Life Saving Foundation, since 2013. Deputy Branch President, Surf Life Saving Sydney Northern Beaches, 2012-2013. Past Marketing and Publicity Officer. Level 1 Official, since 2010. Level 1 Coach, since 2007. Member, since 1998; Life Member, since 2015. Pittwater Woman of the Year, 2014. Pittwater Volunteer of the Year - Surf Life Saving, 2010. For service to veterans and their families, and to surf lifesaving. Manager, Sydney Northern Beaches Veterans Centre, (Ex-Service Organisational Cooperative involving Department of Veterans Affairs, RSL Life Care, Legacy, and the Vietnam Veterans Association), 2012-2015 and Widows Claims Officer, since 2012. Legatee, Northern Beaches Division, Legacy Australia, since 2007 and Chair, 2010 and Secretary, since 2012. New South Wales Representative, National Pensions Committee, Legacy Australia, current. Pensions Officer and Vice-President, Avalon Beach Sub-Branch, The Returned and Services League of Australia, since 2010. President, Newport Surf Life Saving Club, 2000-2002 and Deputy President, 1995-2000 and Member, since 1992. Gold Medallist, Olympic Champion and Co-Captain, Women's Rugby Sevens, Rio Olympic Games, 2016. Captain, Australian Team, Women's Rugby World Cup, 2014. Player, Women's Rugby World Cup, 2010, 2014. Player, Rugby World Cup Sevens, 2013. Board Member, Rugby Union Players Association, since 2014. Player Advisory Panel, International Rugby Players' Association (IRPA), current. Named as a Member, World Rugby Dream Team, 2015-2016 HSBC Women's Sevens World Series. Gold Medallist and Olympic Champion, Women's Rugby Sevens Rio Olympic Games, 2016. Team Member, Sevens World Series, Dubai, 2013. Member, Women's Rugby Sevens, ACT, 2014. Member, Australian Women's Touch Football Team, Touch Football World Cup, Scotland, 2011. For service to the international community through humanitarian programs. International debut, Sevens World Series, Dubai, 2013. Australian Youth Olympic Festival, Sydney, 2013. Gold Medallist, Women's Rugby League World Cup, Great Britain, 2013. Named as a Member, World Rugby Dream Team, 2015. 3rd, Langford Sevens (Langford, Canada). Debut, Sevens World Series, Houston, 2013. Member, Queensland Rugby League Women's Team, State of Origin, 2006 and 2005. Member, Queensland Touch Mixed Team, State of Origin, 2006. Member, Australian Team, Women's Rugby World Cup, 2014 and England, 2010. State Representative, Australian Capital Territory Strikers, Hockey, 2007. Recipient, Australian Women's Player of the Year, Australian Rugby Union, 2010. Recipient, Rookie of the Year, ACT Rugby, 2008. For distinguished service to science and the development and commercialisation of medical biotechnology, particularly through the cochlear implant program, and the management of respiratory conditions. Chief Executive Officer, Cochlear, 2004-2015. Non-Executive Director, ResMed (an American based company that is a global manufacturer of products that help manage sleep-disordered breathing and other respiratory conditions), since 2004. Non-Executive Director, Research Australia, 2000-2004 and Chairman, 2004-2010 and Honorary Life Membership, 2010. Member, National Health and Medical Research Council, Health, Innovation Advisory Committee, since 2015. Member, Innovation Australia, since 2016. Governor, Centenary Institute of Cancer Research and Cell Biology, since 2015. Member, Monash Industry Council of Advisers, Monash University, since 2014. Member, Australia's Innovation Task Force, Business Council of Australia (BCA), 2013-2015 and Member, BCA, 2005-2015. Member, New South Wales Innovation and Productivity Commission, since 2012. Member, Macquarie University Foundation Board of Patrons, 2010-2014. Member, Vice Chancellors Industry Advisory Group, University of Technology since 2009. Member, Advisory Council, Faculty of Medicine, University of New South Wales, since 2007. Member, Jobs for New South Wales, since 2015. Alliance Professor, appointed at the University of New South Wales, King's College London and Arizona State University. Honorary Fellow, Australian Institute for Business and Economics, University of Queensland, 2015. Fellow, Australian Academy of Technological Sciences and Engineering, 2001. Fellow, Australian Institute of Company Directors. Honorary Fellow, Institute of Engineers in Australia. Honorary Doctorate, Doctor of Science, University of New South Wales, 2012. Honorary Doctorate, Doctor of Science, Macquarie University, 2010. Recipient, Global Business Leader Award, Graduate School of Management, University of New South Wales, 2006. Recipient, Centenary Medal, 'for service to Australian society in innovative management and technological industries,' 2001. Recipient, Professional Engineer of the Year, Institution of Engineers Australia, 2015. For significant service to the tourism sector through executive and advisory roles with travel industry associations, and to the community. President, Visit USA Organisation Australia, 2014-2016 and Founding Committee Member, since 1991. Member, Tourism Industry Advisory Board, School of Travel and Tourism, Southern Cross University, 2001-2011. Chairman, Australian Council of Tour Wholesalers (now Council of Australian Tour Operators), 1996-2000 and Committee Member, 1995-early 2000s. Non-Executive Director, Australian Federation of Travel Agents, 1997-1999. Non-Executive Director, Australian Tourism Industry Association, 1986. Past Board Member, Inbound Tour Operators Association. General Manager, Sales and Key Relationships, 2000-2015. Owner/Director of Sales and Marketing, Escape Travel, 1998-2000. Director, Sales and Marketing, Creative Tours, 1990-1998. General Manager, North America, 1987-1990. Qantas Holidays Manager Inbound, 1983-1987. Member, Internal Management Consulting Team, 1981-1983. Training Manager, Cabin Crew Training College, 1970-1974. Secretary, Palm Beach and Whale Beach Association, since 2013 and Committee Member, since 2010. Non-Executive Director, Ryde Family Support Service, 1998-2002. Non-Executive Director, Camp Quality, 1994-1998. Non-Executive Director, Drummoyne Rowing Club, 1990s and Accredited Rowing Coach, 1995. Authorised Civil Celebrant, since 2013. For significant service to sports aviation as a pioneer of innovative design and development of hang-gliding and para-gliding equipment. Inventor and developer of the 'Delta Ski Wing' kite, 1963. Developed and constructed an 'A' frame and weight shift control system which allowed the Delta Ski Wing kite to be accurately manoeuvred, allowing it to develop to the next stage of foot-launched hang gliders and paragliders enabling them to be flown from hills and cliffs, 1964. Recipient, Chairman's Award for Achievement, Aerospace Australia, 2013. Recipient, Oswald-Watt Gold Medal, 'for the Most Notable Contribution to Aviation by an Australian', Royal Federation of Aero Clubs of Australia, 2013. Recipient, Gold Air Medal, 'for the invention of the modern Hang Glider', Federation Aeronautique Internationale, 2012. Recipient, Presidential Citation, 'for the invention of the modern Hang Glider', United States Hang Gliding and Paragliding Association, 2011. Diploma, 'for the invention of the modern Hang Glider', Federation Aeronautique Internationale, 2007. Recipient, Certificate of Recognition, Hang Gliding Federation of Australia, 2006. Inductee, 'for the Invention of the Hang Glider', NASA Space Technology Hall of Fame, 1995. Life Membership, British Hang Glider and Paraglider Association, 1993. Life Membership, Hang Gliding Federation Australia, 1993. For significant service to the broadcast media industry as a television producer, and as a role model and mentor. Television Producer, 'for over 30 years'. 'The Secret Life of Us', 2001. 'Police Rescue', 1989 - 2004. 'Paper Giants - Birth of Cleo', 2011. His productions have won 29 Logies, 30 AFI Awards, 9 AACTA Awards, 4 People's Choice Awards, and 8 ASTRA Awards. Only Australian television producer to have been nominated for 2 Golden Globe Awards. Recipient, Honorary Master's degree, Australian Film, Television and Radio School, 2011. For significant service to athletics as a sprinter, at the national and international level, and as a role model for young athletes. Gold medal winner, 200m World Indoor Championships, Barcelona, 1995. Female Captain of the Australian Athletics Team, Sydney, 2000.
and 200m and has won 5 National Double crowns in 1992, 1993, 1995,1997 and 1998 and a 6th National Crown for the 100m, 1999. Winner, 11 Australian Track and Field National Titles. Holds the record for the fastest time ever by an Australian for the 200m run, Stuttgart Germany, 1997. From 1994-2014 held the fastest time by an Australian for the 100m. Silver and Bronze medal winner, Commonwealth Games, Canada, in 1994. Twice named Female Athlete of the Year for performances on the National Grand Prix Tour. Named 'Sports Personality of the Year' by the readers of the Daily Telegraph at the NSW Sports Awards, 2000. Mentor, Under 17 Development Squad and Under 19 Talent Squad, current. Ambassador, Road to Rio Mentoring Program, Australian Olympic Committee, 2016. Coach, Little Athletics New South Wales, current. Ambassador, Can Too, since 2015. For significant service to the performing arts, particularly to music, as a conductor and administrator, and to professional associations. Director, Optimo Music Software, current. Director, Australian Wind Orchestra, since 1989. Conductor, Symphonic Wind Orchestra, Sydney Youth Orchestra, until 2011. Established Action Music, Sydney, 1992. Conductor, Melbourne Youth Symphonic Band, 1986-1991. Education Services Manager, Yamaha Music Australia, 1981-1991. Conductor, Wind Symphony, Melbourne College of Advanced Education, 1983-1987. Association, 1984 and President, 1984-1990. Honorary Life Member, American Bandmasters Association, since 1994. Honorary Life Member, Australian Band and Orchestra Directors' Association, since 2005. Recipient, Citation of Excellence, Australian Band and Orchestra Directors' Association, 2004. Fellow, Academy of Wind and Percussion Arts - National Band Association (USA), 1999. Recipient, Citation of Excellence, National Band Association (USA), 1993, 1998, 2006. Honorary Life Member, Phi Beta Mu, since 1984.